This book just isn’t doing anything for me right now. Like, at all. And I’m not sure if that’s because of the writing (which isn’t necessarily HORRIBLE, given some of the truly terrible stuff out there), or because the first story arc as a whole, which I like to call “Super Blasty Magic Battle,” didn’t interest me at all. I honestly just don’t care enough about the Sorcerer Supreme or any of that stuff to be able to get into this—which is why I’m going to give it another go with the next arc before I ultimately dub it shelf fodder. Ergo, I want to say that the problem so far lies with me and not the story … but then again, isn’t it the mark of a good or great writer that he or she can MAKE you care about something you didn’t before? I have something of a pastime of ragging on Brian Michael Bendis, and I’m honestly not trying to—it’s just that my feelings toward him are currently lukewarm, and … well … what’s he done for me lately? Outside of maybe Scarlet, the answer is: not much. I’m sure this has been addressed elsewhere in comicdom on the interweb, but the fact of the matter is—and this is a real turn off for me—that the Avengers mostly all sound the same. I really can’t decipher The Thing from Spider-Man from Jessica Jones from Ms. Marvel … because they ALL sound like Spider-Man (who is essentially useless here, by the way). I didn’t know Ms. Marvel could quip like that. Stuart Immonen, I want to say, does some pretty cool stuff, but the most recent issue that wrapped up the first story arc was kind of a “miss” as far as the big battle scene went. Half the time I couldn’t tell what in the world was going on, and the other half of the time, I didn’t care. He didn’t make me care. He didn’t really hit me with anything at all aside from a few dramatic facial expressions and a panel of Dr. Strange with a lone tear in the corner of his eye (which comes across as cliché rather than emotional). That’s all kind of pathetic, given that a character dies in this issue. And who are we kidding with that? Look at the cover and I promise you, you’ll know who it is. Maybe my dissatisfaction toward this issue in particular had something to do with the fact that I was reading it on the commuter rail far too early in the a.m., but come on—the death scene at least SHOULD have hit me. It should have been epic, but instead it floundered. A small girl with a big gun. I do want to say, despite whatever I felt was “off” about the last issue, there is a definite light-hearted quality to this book overall, which I think is what keeps readers coming back to it. It’s not heavy. Despite fighting a universe-threatening power, the team still manages to make you laugh. 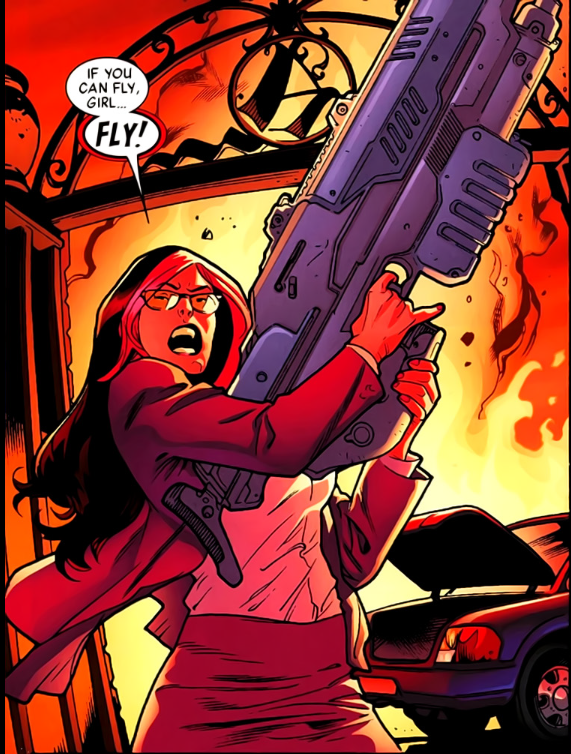 Victoria Hand still manages to walk around toting a fraking huge gun and cracking me up. 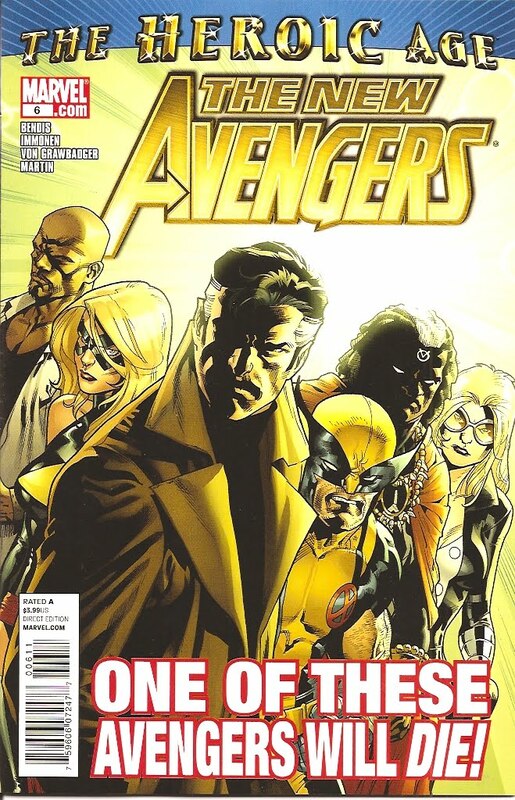 One can argue that, whatever the book’s faults, it’s still good, clean Avengers, so to speak. And maybe in the end, given all of the other Avengers titles to choose from—that’s all this one has to be. This entry was posted on 11/18/2010 by ravenhaired. It was filed under Comic books, Reviews and was tagged with Avengers, Brian Michael Bendis, Marvel, Spider-Man, Stuart Immonen.